This one was taken on the Ashdown Forest in Crowborough at friends clump which is about 10 minutes drive from my house. The clump happens to be one of my favourite places to go to and relax. At around 7pm in the evening the sunshine pours through the the trees creating long shadows and illuminated trunks. So here we go a snapshot of what I got up to hour by hour one Tuesday back in March; It’s Tuesday With Vous for the awesome lady Katherine Sims! I’ve already been emailing from Bed since just after 7. 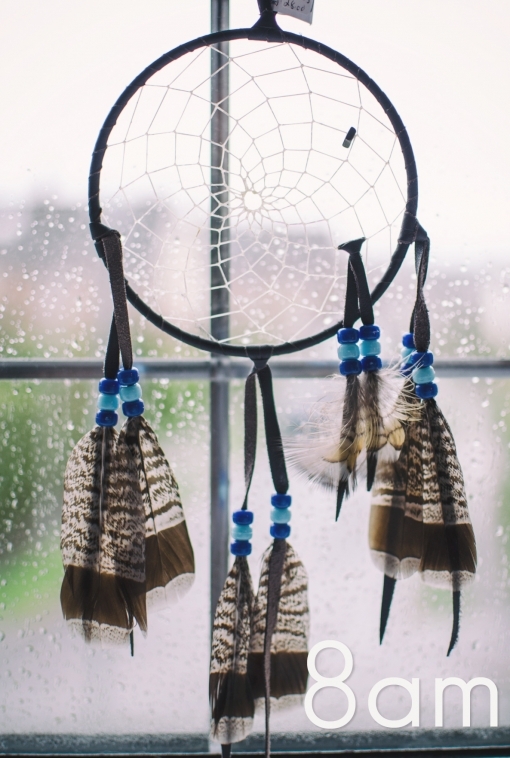 This is my dream catcher. They say that the web captures bad dreams and the morning sun burns them away. It’s from Canada and hand made by First Nations of the Mi’kmaq people. I picked up my dream catcher while on a family tracing holiday in New Brunswick Canada, Last year. Every morning I am reminded of my heritage as my grandfather held and my Canadian Family still hold Mi’kmaq Native status. You wouldn’t think it when you meet me but, I am eligible to have Native status & I’m currently looking into getting it. I’m in my office. My difficult daily commute after breakfast consists of walking up the stairs and stepping into my small office. On one side it’s all digital with my PC named the beast, and on the other is an area for creating including my darkroom which is all packed away. This is one of my great ideas! 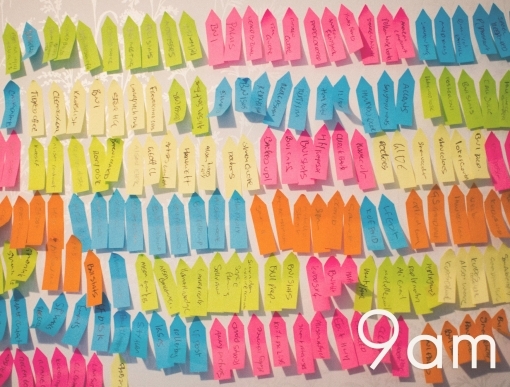 Each time I complete a task big or small I write it on a different coloured sticker for each day and put it on the wall. it’s a great way to track what you’ve been doing and Today’s colour is yellow . I have a shoot at 11:30. Preparation is so important! You hear of photographers failing to do their job because they didn’t think to prepare everything the night before and make sure they have everything they need. I layout my equipment the night before the shoot, on the bench and charge batteries if need be. Then about an hour before I’m due to leave I pack it all up so I’m ready to go knowing that I have everything I need. when I get back it all goes back on the bench to be stored and then I can double check it’s all come back with me. I’m en route to Oxted in my battered Golf called Rocky to photograph my subject. I love the roads to Oxted as we used to take this road to the M25 when we went to visit my Gran. So here is my Subject, a kitchen?! Yup, it can’t always be awesome fashion shoots! Most of my work is commercial, including products, interior/exterior panoramas, corporate head shots and manufacturing processes! Myself & the lovely people from Causeway Joinery who built and fitted the Kitchen, are just giving the space a spruce up, as it’s easier to spend the time here then it is to correct it all in post production! Keeping in the TWV time frame here is the shot I was taking at 1pm. It’s of a fully electric hinge that opens and closes the cupboards for you. Neat huh?! All wrapped up! My client is happy with the images after seeing them on the iPad, so it’s time to go home. It’s really great to do this so any missed shots can be taken there and then! This is the railway bridge in Oxted. There are traffic lights on the other side and I always used to stare out of the back window of my parents car and admire the craftsmanship that went into making each support and rivet, no computer modelling here! If you Whizz past on the way to Edenbridge you might miss this beautiful view overlooking East Grinstead. I’ve I always noticed it and if I’m passing and have the time, I like to stop and admire it what ever the weather! Finally home, here’s a food picture! It’s time for lunch! I love my food and cooking it too. I make a point of having a good meal at lunch, pasta with Parma ham onions and Red peppers Yum! Back to work after a lovely lunch. This is The Beast and has the images downloading and backing up from the earlier shoot. Next up for me is cutting the behind the scenes feature for Kudos that will show what goes into editing the Fashion feature! You might have noticed that my Desk is super high up? This is because I’m trying out standing up while working. Also Maali having stolen my office chair might have something to do with it! I’m still editing, Video takes ages! Work is done for now. So time for a bit of fun! I brew my own beer under the stairs, and today after one week it’s completed the primary ferment and now it is ready to be Kegged! 25 litres of lovely beer!! COFFEE! I love to drink my coffee out of a glass, some think it’s strange but I think it tastes better. Strong black and no sugar is how I like it – just in case you want to make me one! I make it using a paper filter, Perk & Pearl style …and the beer is kegged! It takes a while as you have to make sure everything is sanitised and then doesn’t smell of sanitiser. This is my 8th brew and should be drinkable in just over a week. The keg’s name is a play on my surname, Harquail! Finally time for some Dinner, all be it not healthy and I’m working again! A healthy kebab, a treat from the Parents, much appreciated indeed! I’m a proud member of The Champions Chapter of BNI We’re a referral generating organisation who meet every Wednesday morning for breakfast and to pass business between each other. we’re a group of 18 at the moment and I’m the membership coordinator. I’m doing my meeting preparation while chilling in front of the TV I should really be in bed as my start is at 5:30am. But no, because I am a ‘Night Owl’ I have had a brainwave! I get to shoot features for the awesome and local; Kudos Magazine including the fashion features! I decided to label all the pages featuring my work and use it as a promo tool for my work and Kudos too! Still doing it. Sticking in all of these labels takes forever, nearly done though! Finally bed time! The last thing I do is write down goals to achieve for the following day that whay there are clear targets and you get most of them done early on! Doing Tuesday With Vous for Kate’s Blog has been a lot of fun. It gives you the chance to really think about what you get up to on a normal day. Hopefully you can see that a day as a photographer isn’t always fashion shoots and beautiful locations. hopefully you can take something from what I’ve written and I look forward to doing another one when I have lots of shoots with beautiful fashion people, and stunning locations! If I can help with ‘Developing Your Vision” please feel free to get in touch! For a few of us, life hands out the journey of having depression. I am proud to say that I have been on that journey having emerged from a very dark time in my early 20’s. Andrew Solomon’s talk on how the opposite to depression is not happiness but vitality, is a fantastic insight for people who are at any point on their great journey and for those around them it is a great example of what depression is. Mental health is one of my big interests and I look to improve my knowledge of people’s triumphs over depression every day. I have a massive library of faces found, and since starting this blog I have been posting them from the begining of ym love for pareidolia, but I thought hey why not share what ive found recently! My Sister’s boyfriend found this robot working hard on a building site. Hello my name is Ginger! Sometimes I find my self bored with all of music ( all 4,493 tracks) and Stereomood is where I go for an uninterrupted stream of free music based on your current mood! Currently I’m enjoying some Paris inspired ‘mash up’ beats and favourite tagging quite a few songs. “Favourite tagging?” I hear you say? yes that’s right with your Facebook account you can add to a favourites list and enjoy again and again. You can thank me for dancing in your chair later!